Today especially I am feeling thankful. I have so many reasons to feel blessed and loved and supported. I am so grateful for the love of my family and friends as well as the health of my family. I want to thank all those in the healing profession for their dedication to their jobs, for their caring natures and how well they see to others needs. I am also thankful for my wonderful husband, he takes such good care of his family. I am thankful for my children, for their inner beauty, their good natures, and their balance. I am thankful for my new grandchild and his mother and father's dedication to their family. I am thankful for my sisters and brother, for their love and friendship and courage. I am thankful for my dear friend, for joyous times spent together. I am thankful for all the wonderful friends I have met along my path, those I have met and spent time with and those I have met here on the net. I am thankful for this venue where I have met so many special people. I am thankful for the many opportunities of life that show up each and every day. I am thankful that each day is a new opportunity to learn, grow, love and enjoy! On a sillier note, I am thankful I am finished with my curtains and all that is left is to enjoy them! 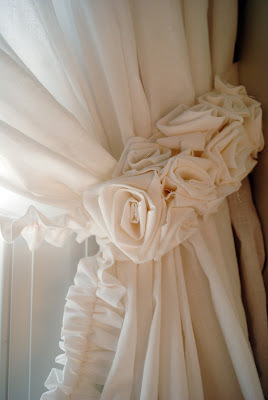 I used unbleached muslin, made a thick ruffle for the edges and then used raw edged strips to create 24 roses which I attached to sashes for tie backs. I am pleased with how they came out. My art room is feeling very cozy now. It has been cold and drab outside. But, mother nature has been showing off in a very special way outside my art room window. That tree that you can see in the photo is bare, except that on and off during each day, Cardinals come to perch in it. One by one they lite on a branch, spaced out as if they were all in agreement. There has been upward of 20 birds there at one time. It looks like they are ornamenting the tree! So gorgeous and so inspiring! I am thankful for them as well. I am working on more jewelry that I will show soon, as well as a new little video. Thank you for coming by for a visit, I do so appreciate you! Oh Terri, What a wonderful post, you have a wonderful way with words, I enjoy visiting your blog. I love your curtains, they are just beautiful and all the beautiful roses, what a wonderful place to create. Thanks for sharing. Your curtains are beautiful! The pretty roses are perfect for the tie backs! I also love what you have on your desk! I really like those curtains. You are one talented lady. And I am thankful to call you my friend! Awesome post and your curtains are beautiful. Love your space! and I think your curtains - and VIEW - are fabulous. Love all the little details you created. They're very romantic. It looks as if on a sunny day, you have a gorgeous light-filled studio! Oh my gosh your curtains with the roses for tie backs so beautiful! such a lovely post~ I love how you changed your header. I am going to change things up again. Kind of like blog spring cleaning. lol, but I have to wait until after my class. What a nice posting about gratitude. I love the curtains and the beautiful Rose tie backs! I'm impressed, honey; those are fantastic! Just beautiful and I'd love to make some for my craft room. Thankful...for you. You're inspiring words and sweet ways are truly a gift. I'm glad to call you a friend. And the curtains are DIVINE! Can I hire you? Sure wish we could someday get together and share a cuppa and get to meet face to face. Until then, I will stalk your blog! Thank you all for your very kind comments! Wow, I am so lucky to have "met" each of you. I love reading your comments and visiting your blogs. I find you all very inspiring! let me start by saying that it's good to see you're such a warm hearted person. You're absolutely right, there's so much to be thankful for, just as long as you keep trying to see it. I've taken the liberty of copying your template as well, I will make one of your shoes with tons of pleasure I'm sure. Thanks also for having a peek at my blog and I really hope that I'll qualify as a member for the MAMA group. Oh my goodness your curtains are STUNNING! I love them. I just love your blog all together! There are always such pretty things here. It was so wounderful to read your blog tonight.It made me sit back and think yes i too should be thankful for alot of things i take for granted every day.thank you Terri for reminding me to. 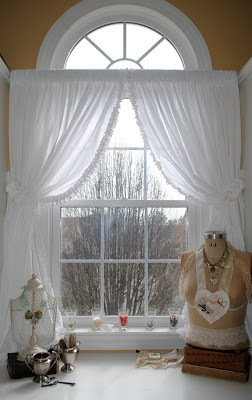 An inspiring post Terri and your room's looking lovely....I really like those ruffles on the tie-backs!